In honor of Intellectual Disability Awareness Month, Vocational Rehabilitation shares a story about two high school students with disabilities getting started on their careers through Project SEARCH. Elijah Shannon works in the hospital child life department after graduating from Project SEARCH. You have to work hard for what you want. My goal is to stay here as long as I can, get old, and retire. Most high school students don’t know what they want to do as a career when they graduate, but not Chloe Montanari. Chloe, who has an intellectual disability, had decided on her career path and was offered a job before she even graduated! She works full time in the dietary department at Johns Hopkins All Children’s Hospital in St. Petersburg helping with food prep and cleaning the cafeteria. She’s a perfect example of a program that works – Project SEARCH. Project Search is a unique program designed to help students with intellectual disabilities successfully transition from high school to the workforce. Over the course of one year, students have the chance to participate in targeted internships hosted at job sites across the state. With the assistance of a teacher, job coach, and site supervisor, Project Search students gain hands-on experience in a professional setting. Chloe got involved in Project SEARCH through Vocational Rehabilitation (VR), a federal-state agency that helps people with disabilities get or keep a job, when she was a high school student making plans for life after graduation. She met with VR Counselor Kristie Berger, who referred her to Project SEARCH and matched her with job coach Maylin Kuri to learn the skills she would need to be successful in the workplace. Chloe interned at All Children’s Hospital, working in several different departments throughout her year in the program. Her supervisors quickly took notice of her exceptional job performance and offered her a permanent position in the dietary department. The feeling is mutual. “I work with good people,” says Chloe. “They are the best part of the job.” One of those co-workers is another Project SEARCH graduate, Elijah Shannon, who also has an intellectual disability. 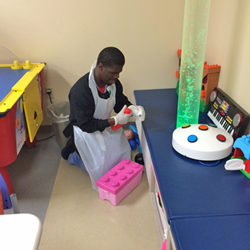 Elijah works in the child life department, where he cleans and sanitizes toys for the young patients. Elijah also found Project Search through VR. When he met with Kristie as a high school student, she enrolled him in the program and also paired him with a job coach Maylin Kuri to help him develop professional skills. Elijah interned at several different places, including various hotels at the beach, but he always enjoyed his time at All Children’s Hospital. A year after completing the program, he started working there, and he has quickly proven himself to be a valuable employee. He recently received a raise after his job performance was praised by a supervisor. With programs like Project SEARCH and employers like All Children’s Hospital, they are getting that chance. Johns Hopkins All Children’s Hospital was recently honored as a 2016 Outstanding Employer for hiring people with disabilities, and its work with Project SEARCH.